Of all the ridiculous things to be sentimental about . . . I get all slushy and mawkish about my potholders. Yes, potholders. I’ve had (and used!) the same potholders for over two decades. I received them as a wedding gift (or maybe they were a shower gift?) in 1992. I haven’t the foggiest recollection who gave them to me. But one might say I’m devoted* to them. You don’t have to tell me they’re ugly. I know they’re ugly — ugly and awesome! They’re mauve and wedgewood blue — it’s like setting the DeLorean for 1992 every time I take a casserole out of the oven. And they’re still perfectly serviceable. But my daughter says they’re embarrassing. She’s begging me to get rid of them. And she’s not alone — you have no idea how many potholders I’ve received as hints gifts in the last few years. And yet . . . I can’t seem to part with them. Everyone keeps trinkets from the past, I’ve kept potholders. And honestly, I’m not sure why. They remind me of all the kitchens we’ve had (six in all), and all the meals they’ve helped prepare. 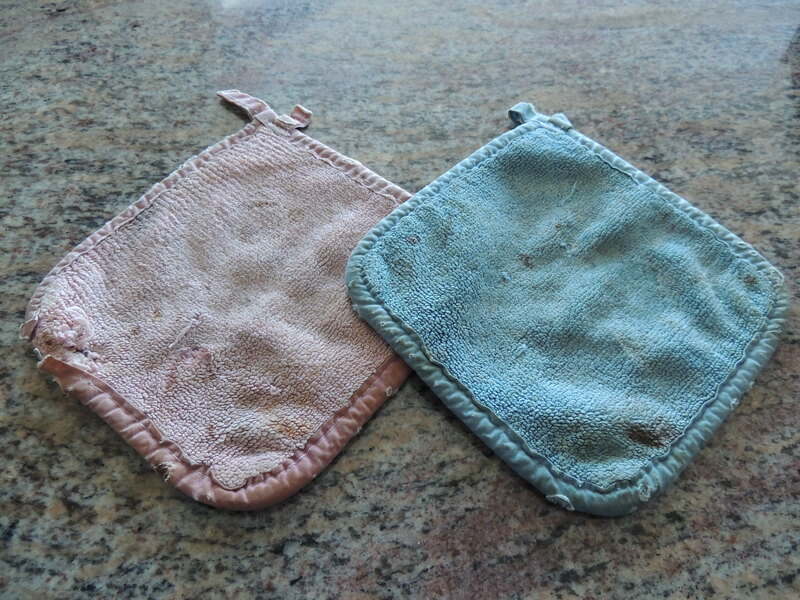 At a certain point, they became a source of pride — not everyone uses decades-old potholders. And once my daughter was old enough to start being embarrassed by them? Well, then it just became a really fun game of Torture the Tween. My potholders don’t really have anything to do with wine . . . per se. I mean, I’m sure I’ve spilled wine on them before, but that’s about it. But if I’m going to attempt to get rid of them, they deserve a proper send-off. So I started thinking about the best way to do that, and settled on buying a bottle of wine from the year we got married, 1992. And while I would have loved a California cult Cabernet or a first-growth Bordeaux from 1992, I’m saying goodbye to potholders, for Pete’s sake. Let’s not get crazy. So I decided to keep the price tag in the realm of reasonable ($45), and settled on a 22 year old German Riesling. BTW, if you’re ever in the market for an older wine, Wine Searcher is a fantastic resource for your search. Here’s something you don’t see every day — wine crystals on a cork. Quite pretty, really. In the glass, a stunning amber color. The nose is petrol, silly putty and toffee. Flavors are minerals and smoke with a backdraft of citrus and peach. And oddly, I get some diesel notes, too. Does that even make sense? Still bright with acidity, though all the edges have been sanded down. Lovely. I would love to see what this is doing in another decade. 1992 under the foil . . .
My aged Riesling was an absolutely perfect partner for my take-out, spicy Pad Thai. But the surprise of the night came when I tasted it with my daughter’s mango & coconut sticky rice. There’s a chameleon in my glass! The Riesling took on an unexpected and delightful dry sherry character. Wow. Interesting sidebar: I mentioned to a blogging friend (and Riesling expert-in-residence), The Winegetter, that I was drinking a 1992 Schloss Schönborn Riesling. And he altered me to the fact that Schloss Schönborn is currently involved in a fraud case in Germany. Schloss Schönborn is accused of blending wines from different vintages, and even different regions — a big no-no in the German VDP (Association of German Prädikat Wine Estates). 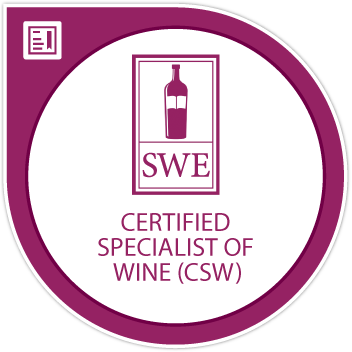 VDP members agree to adhere to certain standards which are slightly more stringent than those set down in “regular” German wine law. There are rules, and then there are rules. Schloss Schönborn has temporarily removed itself from the VDP so as not to tarnish its reputation. But I suspect it will be back. So how ’bout that? I got to taste a beautiful 22-year old German Riesling, laced with intrigue . . . all because of my potholders. I thought I could get rid of them, but I can’t. Scratch that requiem and make it a retirement. New idea: They’re going to live in my hope chest, as heirloom potholders. And one day (far, far from now), I will give them to my daughter (on permanent loan) as a wedding shower gift. I can see her eye roll right now. And then she will look under the potholders, and she’ll see a “new” bottle of Schloss Schönborn Riesling Auslese Hattenheim Nußbrunnen 1992 (yep, I ordered two bottles — I’m a planner). That bottle is for a little pre-wedding, mother-daughter bonding. Whoever this boy is . . . he’ll have to wait his turn. Old, new, borrowed and blue. My work here is done. 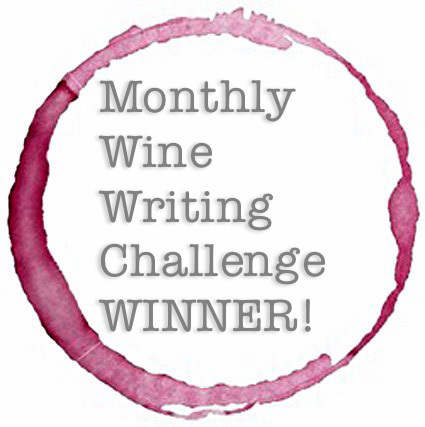 *This is my entry in the Monthly Wine Writing Challenge, #7. The theme this month is: Devoted! I have seen a lot of red crystals on the cork – from the red wines, of course – but this is the first time I see the white crystals. Salut! Thanks, Anatoli! I had never seen the white crystals on a cork before, either. I went back and forth as to whether they were sugar crystals or tartaric acid. My husband tasted the crystal and said it was pretty tasteless, maybe a smudge sweet. So I’m still not sure. Hope you have a great weekend! Salud! Awww… such a nice post. I can understand why you are attached. I’m the same way with certain things.Interesting about the crystals, have never seen that before. Thanks, Suzanne! A first for me with the white crystals, too! Such interesting things we discover when we open a bottle of wine . . . Salud! Love everything about this post. Being married in 1992 myself, I have a few things from the archives too that I have a hard time parting with! Thanks, Marcia! 1992 was a pretty good vintage, huh? What trinkets have you kept? Salud!! Kirsten, I have a classic crock pot. You know… the one with the removable Corning casserole dish. Lopsided and stained, yet the pulled pork or bbq beef always turns out beautifully! Cheers! Ooooh! I have one of those, too! 💜 my Crock-pot!! An enjoyable read Kirsten, as are all of your blogs. Individual treasures are treasures, no matter their external appearances. Us men have treasures too, old shirts, old shoes, old tools. I have set of Craftsman dykes, that are nothing but memories of my Dad, and us dove hunting together starting when I was only old enough to run get the fallen birds. I don’t know many pairs of wings they clipped off over their years in preparation for meals par excellence* but they still work like new, although a bit rusty and dinged. And sometimes, we pass them on. Norbert Ussfeller, whom I imagine you know, has a hammer of similar memories from my dad. It traveled the world with me and at some point Norbert needed it more than I did for a few days, maybe 2003 Santa Domingo Pan Ams? and it went home with him. I told him about it at some point, and he tried to give it back but I really wanted him to have it. At one point, Norbert had given me some of his fathers medals, from that earlier war, treasures that had to be hidden, because of hooked cross symbol, once meaning peace, but had become the ultimate non PC symbol of modern Germany. He knew that I would treasure them for their history, and because they were his, and his dad. And so it goes. I imagine at some point in her lfie, you daughter will look on those ragged cloths of yours with love unbounded. Rosebud……. *That little sliver of sweet meat in the center of dove breast is as close to culinary ecstasy as can be found on planet earth me thinks. Hey Scott! Thanks for stopping by and taking the time to share your own story about the emotional trinkets we keep and pass on. Lovely. Cheers! I love how you tied everything together! Great post! Thanks so much, Linda! I’m glad you enjoyed it!! Salud! That wine looks beautiful, the potholders not so much… But I get it. I have some that look like they were used to perform many unmentionable crimes. Luv em that way. The new potholders just aren’t as good, are they? I especially don’t like those silicone squares . . . no control. A burn waiting to happen! Salud! I love how you always put an entirely different twist on the theme and make me laugh out loud. Brilliant. Thanks so much, Sally! I’m so glad you enjoyed it! Cheers!! Fantastic! Sentimental, wine, tween torture, scandal, what more could one ask for? This is great! I’m honestly relieved that you didn’t get rid of the potholders (it makes keeping my 25 year old Kona coffee clip suddenly “okay”). Cheers, my dear! Thanks, Kirsten! I’ve had a couple of folks tell me they’re glad I didn’t get rid of my potholders! And it’s totally OK to keep your 25-year old coffee clip . . . it’s just starting to get character! Salud! I’ve always loved this label with archbishop/prince electors on it…. :) You know what this wine would have paired well with too? Steak! I kid you not. I love aged Riesling Auslese with steaks…lucky you for tasting this wine. And naturally: Thanks for the shout out!! I really liked the label, too . . . but couldn’t find any info on the history behind it. Do you know? And STEAK with Auslese?? I’m beyond curious now . . . can’t wait to put that one to the test!! Regarding the Schönborns: The family was a huge deal in the Holy Roman Empire of German Nation. Positions include archbishops of Mainz and Trier (both prince elector positions), duke bishops of Würzburg, cardinals etc. The current archbishop of Vienna is also from that family. Awesome! Thanks for the info . . .
Maybe you’ll recognize some of the faces on the bottle on their Wiki page…lol. I get it, old friends are hard to let go of. I like the idea of passing them on to your daughter. The wine will make her accept them (as with potholders, so with your parents’ old friends; wine makes them more lovable). Absolutely! Wine make everything more lovable . . . 💙💜💚🍷! But you just took the suprize away from your daughter! Great post!